ART OF TRANSIT: Okay, this isn’t the train station we’ve been featuring prominently on this blog in recent weeks. 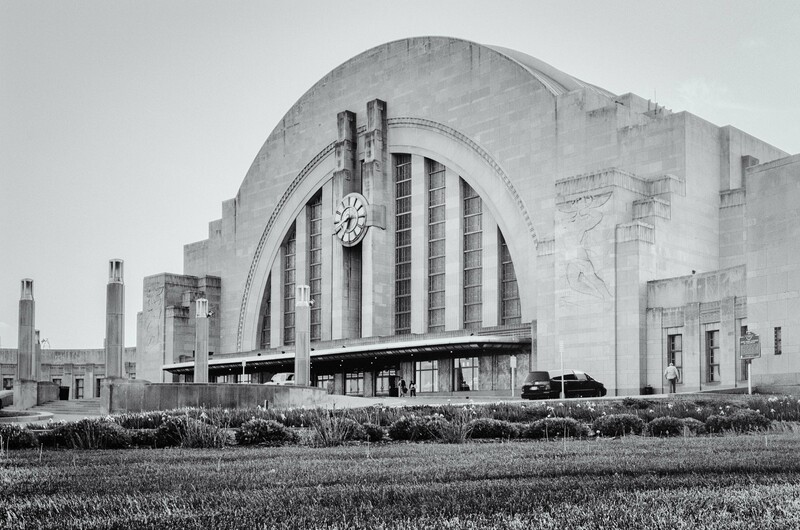 Union Terminal in Cincinnati was completed in 1931 — eight years before our Union Station opened — and is also Art Deco but obviously very different from our station. Also different from L.A. Union Station: Our station is busier than ever in its 75-year history while Cincy’s station is now a museum, served only by a single Amtrak train that runs a somewhat odd route between Chicago and New York. Related reminder: National Train Day is Saturday with associated Union Station and train events. Click here for the rundown of events. Photo by Steve Hymon. Nationwide, pedestrian deaths comprised 14 percent of all traffic fatalities. In L.A., pedestrian deaths accounted for a whopping 41 percent of all killed in car crashes. For New York, it was 47 percent, according to the NHTSA stats. Los Angeles’ per-100,000 pedestrian fatality rate wasn’t at all the highest, at 2.57 percent. But it beat out New York’s 1.52 percent. Scary stuff perhaps attributable to the volumes of cars and people here. While the LAPD’s crackdown on jaywalking in downtown Los Angeles has received considerable media attention, I’m curious how much attention local police — in L.A. and elsewhere — are paying to vehicular encroachments on crosswalks. I see it happen all the time, I can’t recall ever seeing any one pulled over for it in my 20 years living in the L.A. area. Semi-related: transportation accounts for 42 percent of worker deaths in the U.S. including road worker incidents, trucking accidents and even fishing incidents on boats. Writer Bob Gelfand despairs the Metro Board’s decision last week to extend the ExpressLanes on the 10 and 110 beyond next January (which also requires state legislation). He doesn’t like Lexus Lanes, saying they are more likely to be used by higher income motorists. His solution: have tolls based on the value of the car. That strikes me as fraught with problems, namely that the price of a vehicle doesn’t always correlate with a person’s income level. There has also been some evidence that transponder accounts have been opened from a variety of zip codes and census tracts representing a variety of income levels. As for the “class-based society,” it’s probably worth pointing out that Silver Line ridership has increased since the ExpressLanes opened. The pilot program in Illinois would allow pets 20 pounds or under in exchange for a $25 surcharge. Pets would have to be in carriers. Smart move, I think as Amtrak works to speed up its trains in some Midwest carriers and possibly compete with the airline and driving industries. Disclosure: I have dogs and have traveled with dogs frequently in recent years, usually by car. Steve: As a daily user of METRO and Metrolink services, I experience and see the danger of vehicular encroachment at crosswalks on a DAILY basis. Cars don’t even attempt to stop at crosswalks EVEN when they have a red light! It’s a legitimate concern for us pedestrians. It’s a California law that gives ALL pedestrians in a crosswalk the right of way. The Van Nuys/Panorama City area where I work is one of the most dangerous areas I’ve seen. And yet every time one looks to see a police officer pulling people over for violations, absolutely NONE are found! C.U.T. Home of the Superfriends! You make an excellent point about “vehicular encroachment on crosswalks;” I too see it happening quite frequently. Are there any statistics on what percentage of pedestrians killed by cars are actually jaywalkers? Such numbers may tell us to what extent the LAPD’s discourse about traffic deaths and pedestrians is valid or not. My understanding is that pedestrians have the right of way even if crossing illegally. Assuming I’m correct, well, it’s not JUST THE LAW; it’s also A GOOD IDEA!